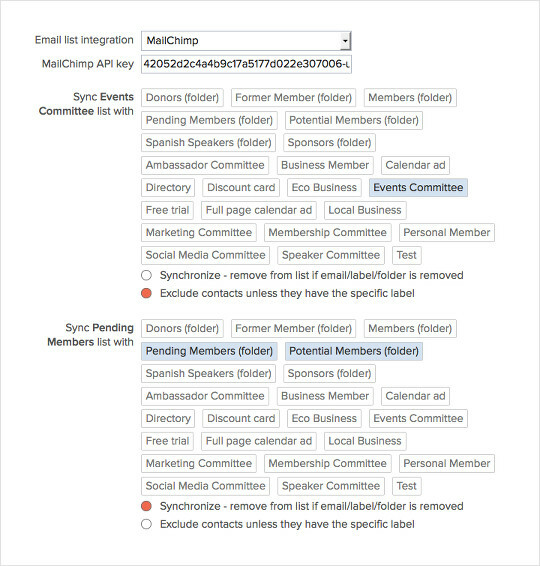 MailChimp integration is provided with all MembershipWorks plans. You can connect a MailChimp email list to a folder or label. Once connected, new emails are added to your MailChimp list when members are added to the folder or label. New emails will also be added to the list when a member with that folder or label updates their email address. Note 1: Old emails will not be removed from your MailChimp list when a member is removed from the folder/label or updates their email. Note 2: All contacts under the account with the label/folder will also be added to the MailChimp list. To connect your MailChimp email list to MembershipWorks, you first need your MailChimp API key. If you do not have an MailChimp API key, sign in to your MailChimp account, and go to Account > Extras > API keys to obtain an API key. 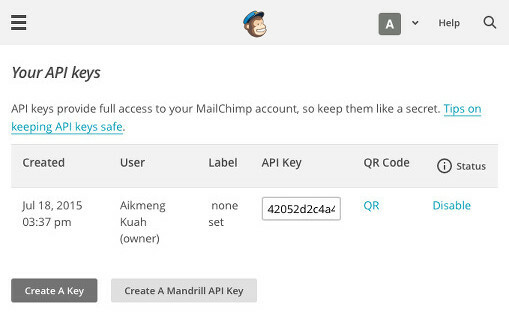 Once you have your MailChimp API key, go to Organization Settings > Lists, and enter your MailChimp API key. You will then be able to select a MailChimp list and folder or label to connect with the list. Have each list synced with one or more folders/labels. Option to synchronize list – remove emails when a member is removed from a folder or label. Option to exclude contacts from list – contacts under an account will not be added to the list unless they specifically have that label. Coming soon – connect an event or form to a MailChimp list. Premium MailChimp is an additional cost service option. To add Premium MailChimp to your account, please go to Organization Settings and upgrade your service plan. Once Premium MailChimp is enabled for your account, you will be able to link all of your MailChimp lists to your labels/folders under Organization Settings > Lists. MembershipWorks provides a field – Opt-out from email list – that can be added to your member signup, member manage and admin profile forms. If this field is set, the member’s email addresses will be removed from all your connected MailChimp lists. Note that each contact on the account has a separate opt-out setting that would have to be set to be removed from the list.